The Cumberland & Dumfriesshire Farmers Mart P.L.C. held their had forward 1,030 head at their weekly sale of breeding sheep with lambs at foot at Longtown on Tuesday 8th June 2010. All classes were very dear. Hoggs with singles:- Texel £92 Lipwood Well, £79 Newbiggin, £78.50 Bayles; Greyface £74, £73 Newbigging, £72, £71 Reagill Grange, £70 Patties Hill. Hoggs with twins:- Greyface £57 Snowden Close; Texel £56 Bayles. Ewes with singles:- Cheviot £64 Newbigging; Texel £62 Rinnion Hills, £59 Mid Harrietsfield; Greyface £54 Newbiggin; Suffolk £52 Castlefairn; Blackface £31 Castlefairn. Ewes with twins:- Texel £62 Rinnion Hills; Greyface £60 Snowden Close; Cheviot £52 Newbiggin; Blackface £31 Castlefairn. 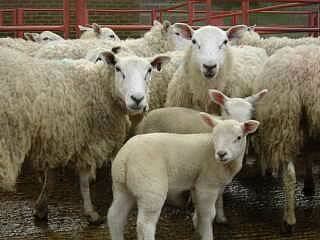 Geld Hill Ewes:- £50.50 Bayles.